We received the message below on December 5th a note from GCE advising us of a meeting next Tuesday 11th which is an important opportunity for us residents to express our views on the landscaping proposals for Salisbury Square. We are owed apologies from someone for the short notice, but please come if you can. "We would like to invite you to a public consultation in York House on Tuesday 11 December to discuss the latest developments for Salisbury Square, and Old Hatfield generally. In April 2012 a public exhibition was held to present the development proposals for Old Hatfield and the fully consented plans for Salisbury Square. In July 2012 First Capital Connect and Hertfordshire County Council presented plans for the re-development of Hatfield Railway Station and the A1000. Now Gascoyne Cecil Estates would like to present three landscaping proposals for Salisbury Square and are keen to gain feedback prior to evolving a final design. Hertfordshire County Council will also be presenting the current plans for revised footpaths and the A1000. The consultation will take place on Tuesday 11 December between 12- 8pm in York House, Salisbury Square, Old Hatfield. We very much hope that you will be able to visit the exhibition to view the proposals and gain insight into plans that will regenerate Old Hatfield." Posted by Old Hatfield Residents Association. Yesterday you might have caught sight of PK, local hero, up a ladder fixing lights to the tree opposite the 8 Bells. 26th November news update: Station developments, Platform 3 etc..
"The next Stakeholder Event will relate to plans for changes to the Great North Way and associated highways works. This will be organised by Hertfordshire County Council with support from First Capital Connect. This will take place early in the new year. There will be an open meeting on Thursday November 8th at 8pm to give you the latest news and a forum to feed back your views. On developments, Anthony Downs of GCE (Hatfield House) will brief us on Salisbury Square (progress with landscaping options, Jobcentre, etc.) and on Station developments (Car Park and temporary parking). On-line information is not very up-to-date. 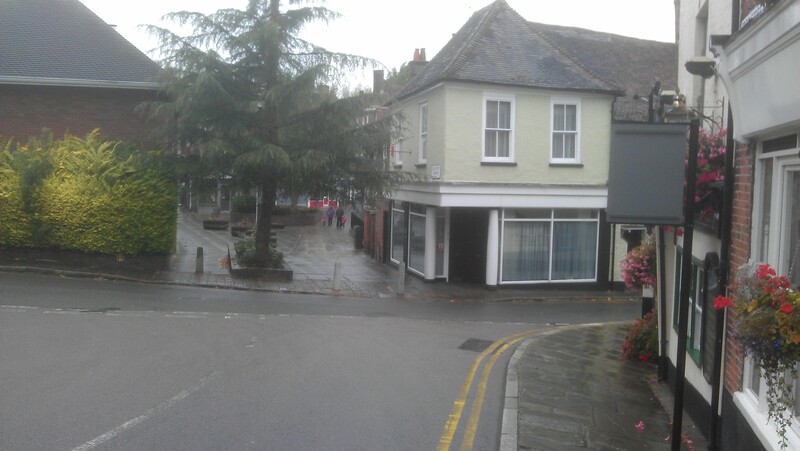 Christmas Tree and carols in Old Hatfield this year? The 5th newsletter was sent to residents in October following the July public consultation in York House. Following the recent exhibition at York House showing the plans for the station upgrade - the County Council have published a presentation on their website providing more details.